Well, its Spring! And you know what that means. Its time to get outside, soak in the fresh air, and use the nice weather for some off day workouts. As a gym, we understand that putting in the work and doing the same redundant exercise routines can be tough. I think the toughest part of it all is the place in which you workout, not the exercise itself. I find it so valuable to have the ability to get outside and explore the earth while trying to stay fit and active. That’s why I am today writing about a few places that you can go, hike and enjoy the weather. Hiking is great for so many reasons. From cardio, to strengthening the body, to just allowing your body to take in the scenery and get fresh air, there really is something to be said for going out and hitting the trails. Below are a few spots that I think would bring a lot of people joy and stimulate their body and brain. Mianus is based here in Stamford and has some really great trails for you to enjoy. With this spot so close, you are able to make the short ride and walk for about 20 minutes without getting lost. This spot is a haven to all with the ability to go fishing, walk your dog, or go for a ride on your bike in the trails. Be careful of the roots and branches laid across the path and some rocky terrain in a few of the areas on the way back to the car. Make it a short hour or couple hour stint to get some low impact cardio in. Based out of Rockland and Orange county NY. Harriman is a beautiful state park filled with lakes and landscape that is absolutely gorgeous. This 46,000 acre park is filled with low level hiking trails that are easily accessible to all skill and fitness levels. You will find yourself stopping frequently to take in the scenery and enjoy the day trip you have made out of it. Based out of New Cannan Conneticut. This park is not only a beautiful spot for viewing fields, ponds and general landscape, but in the center of the park is a castle built in 1912. The castle also has a few other fun facts, being that it was featured in two camera productions. The trails are simple and can be an easy place to walk around, hike on a nice sunday morning/day. Based in New Haven Connecticut. The Sleeping Giant is just that. Described as a traprock mountain with a high elevation and rugged terrain. With over 30 miles of rocky terrain, steep elevation and expansive cliff tops, you will get your heart up one way or another. Consider wearing hiking shoes or boots and going on a clear sunny day. Be mindful of how you feel and ready to traverse a lot of up and down areas. Consider building yourself up to this hike with the others. The Vessel. Not your typical hiking spot but definitely a sight to get some low level activity in and good day trip. Based in NYC, this 150 foot tall structure, allows 1,000 people at a time traverse the 2,000 plus steps with 80 landings and over mile long stair structure. Reservations required to make this an adventure, but it will be just that. An iconic structure that can be traversed as fast or as slow as you want in the big city. So there you have it. 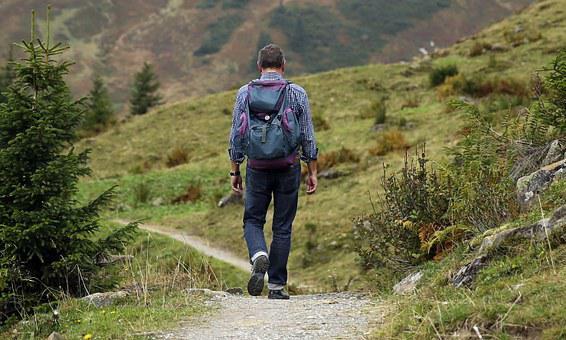 5 amazing places that you go for a hike or just walk to get your fitness on . Remember this months challenge is all about doing a little bit more work and proving to yourself, a little bit of consistent activity and action can add up to big results. I would add that making it fun and enjoyable, should be something that becomes a staple of your fitness journey. Hope you get the opportunity to try and make it to one or all of these amazing sites. Let us know what you think and share your pictures of amazement.